Dating is tough, and first dates can be particularly awkward if you don't know anything about the other person. What you say and do can determine whether there's a second date, so it's important to present your best self. You shouldn't expect perfection, so don't stress too much about stumbling over your words or moments of silence. Chances are, these won't make or break the night. But you might shoot yourself in the foot if you make a few terrible money moves. If I've said it once, I've said it a million times: There's nothing wrong with going Dutch on a first date — just don't be a jerk about it. If you initiated the date, pick up the tab. Conversely, if the other person initiated the date, you can expect that they'll pick up the tab, but don't assume that's the case. Offer to pay half, and make your decision on whether you want to have a second date based on their willingness to accept your offer, or if they cover all of it. If your date picks up the tab for the night, go easy on his or her pocket. There might be wiggle room in the budget for dinner, drinks, and maybe dessert, but this doesn't give you the green light to order the most expensive item on the menu or suggest costly activities that leave your date broke. Not to say you should only order a cheap salad and water, but be reasonable. In an effort to impress your date, it's easy to go a little overboard to create a memorable night. You should have fun, but not at the expense of your bank account. Check your finances and determine how much you're able to spend for the night, and then recommend a restaurant or activities within your budget. If you have a firm grip on your personal finances, you will likely seek a partner with a similar financial mindset. It's important to have financial discussions with a significant other to avoid surprises down the road. But the first date isn't the time or the place to get into all that nitty-gritty. If anything, your date might consider personal financial questions intrusive, which sets a negative tone for the night. Likewise, if you pry or inquire about your date's income, this person might assume you have an ulterior motive. And if you ask about their debt or credit score, they might feel you're getting too close to soon, which can scare them away. Give it some time. Wait until you have mutual feelings for each other. Only then should you sit down and have an honest discussion about your financial lives so you can make the best decisions for yourselves moving forward. Not only should you avoid asking your date personal questions about their financial life, avoid sharing too much information about your financial life too soon. Maybe you're proud of your job, your accomplishments, and your strong financial background. Or maybe you feel dropping salary information will amaze the other person and keep them around. But bragging can be a turn off. If you spend the majority of the night patting yourself on the back and revealing how much you earn and/or spend, your date could conclude that your ego is too big and run for the hills, or only stick around because of what you bring financially to the table. It is common and acceptable to ask about occupations on a first date, but don't get into detail about salaries. Bringing up negative aspects of your financial life on a first date can be just as disastrous as bragging. Remember, the idea is to make a great impression, not come off as a liability. 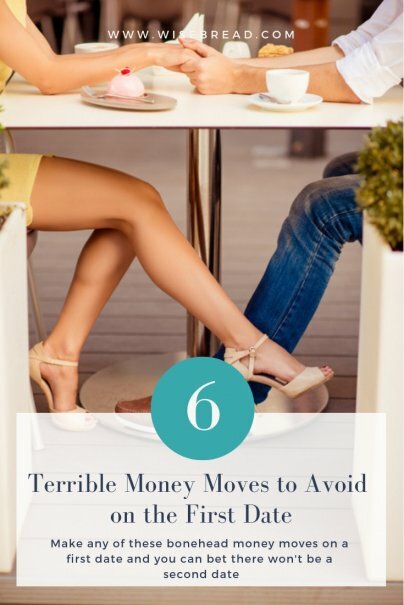 If you mention your poor credit history, excessive credit card debt, or poor financial outlook, yet your date has a tight handle on their finances, this person could make assumptions before getting to know you and presume you're irresponsible. You shouldn't hide these issues, but you should get to know each other before airing your dirty laundry.